www.signs-of-end-times.com - Showing from the Bible and the world today the signs of the end times. When you look at all the signs in this website, there can be no doubt that we are living in the last days. www.protestant-reformation.org - A website aiming to "rekindle" the reformation in the world and reveals who is behind this ecumenical movement and who God's church is in these last days. http://www.worshipinspiritandtruth.net - A great website full of encouraging Bible studies to inspire you into true Christian service and worship of God. This is a must visit website for any serious Christian. http://www.secondcomingofchristjesus.net - A website focusing on the second coming of Christ Jesus, sharing the Bible truth about the secret rapture theory, the great tribulation and the 1000 year millennium. www.thesabbathday.co.uk - Sharing the widely rejected and much needed truth about the seventh day Bible sabbath, God's holy day of the 4th Commandment. www.truth-about-hell.com - A website proclaiming the truth that hell does not literally burn forever, with lots of scripture to back this up. Find out the truth about this greatly misunderstood subject. www.markofbeast.net - A website that focuses on the true Word of God rather than make mad speculations about what the mark of the beast is. www.the-bible-sabbath.com - Another great website sharing more clear Bible truths about the Sabbath Day. 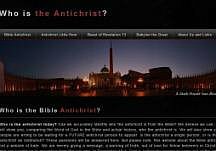 www.the-bible-antichrist.com - Revealing who the Bible antichrist is and who Mystery Babylon, the Mother of Harlots is. www.theseal-ofgod.com - What is the Seal of God and what does it have to do with the Mark of the Beast? Find out the Bible truth here. Below are more trusted websites from other ministries sharing the truth of God's Word.